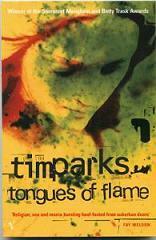 Yesterday I came across a novel by Tim Parks which I had never gotten around to reading: Tongues of Flame (London: Heinemann, 1985). So I read it while the kids were taking their afternoon nap. I wasn’t disappointed. It’s the most autobiographical of all Parks’ novels, and it tells the story of a London church that gets visited by “the Sword of the Spirit”—i.e. by charismatic renewal—in the 1960s. It’s a humorous story with some real insights into the potential hazards of revivalism, and it builds toward a chilling climax. Without wanting to spoil the story, I should also say that it contains a superbly disturbing scene of exorcism.